The first and last time I was in Jeju was 16 years ago, my freshman year of high school. That year was a tumultuous one, full of adolescent angst and a whole gamut of emotions. But I do fondly remember my trip to Jeju - my brother and I tagged along with my aunt, uncle and cousin on a trip with their friends. 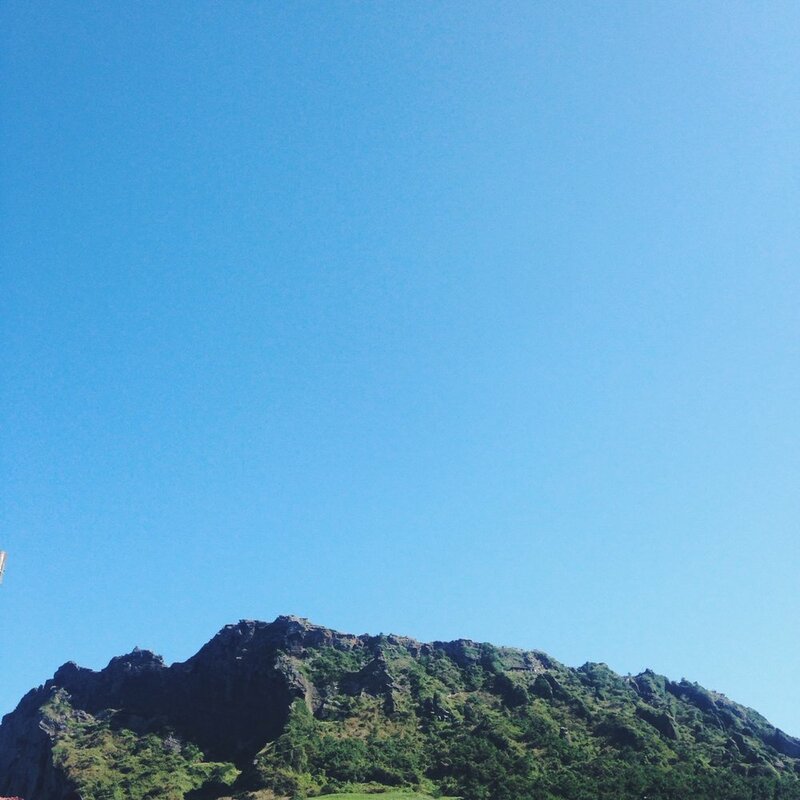 Last weekend, Y and I went to Jeju for 3 nights, 4 days. A typhoon had passed through only a few days before our arrival and the lingering effects of it were felt - the first two days were filled with intermittent downpours. We spent our first full day escaping the rain in sundry indoor spaces: O'Sulloc Tea Museum, Bangju Church, Bonte Museum. Married to an architect, I have grown to appreciate buildings and architecture. The husband calls architecture "the container of life" and I was grateful it for these containers of life and places of refuge from the temperamental weather. But like they say, after the rain comes the sun and scintillating it was. It was all the more glorious. We spent our days breathing in the fresh autumn air, letting our eyes soak in the blue skies and took the time to say things like, "How beautiful!" "This is so amazing!" Making the most of the weather, we spent one day exploring winding paths through lush forests and rolling hills, the following day making our way along the coast's beaches. Our bellies were filled with a motley of Jeju's finest: abalone, pork belly, seafood stew just to name a few. I went to Jeju just an excitement of getting away from the hubbub of Seoul life and feasting on good eats and sights. But I returned refreshed, rejuvenated and recalibrated, with a greater sense of hope and expectation. To be quite honest, grieving has been a real part of this pregnancy. I often look through Instagram or Facebook and see the places people are traveling to and I'm filled with the occasional pang of wanderlust, an ounce of envy and a sense of loss: "There's another place we won't get to go to," "That's another thing I won't be able to do once baby comes..." Now, don't get me wrong. I am extremely excited for baby's impending arrival but I'm also very aware his impending arrival brings very real impending life changes. A part of me went to Jeju thinking, "Okay, here's one last hurrah." But God must've known my heart. At every corner, every stop, every cafe, there were families traveling with young children. It made me realize that my life won't stop with baby's arrival. Yes, there will be changes. Yes, there will be adjustments. But there will also be a new sense of joy. And I can still travel, WITH baby! Baby, I can't wait to take you to Jeju and to show you the beauty of this country you will be in born in. Korea is beautiful, you'll see. Several weekends ago, with a few dear friends, Y and I went to Samcheok, located in Gangwon Province. 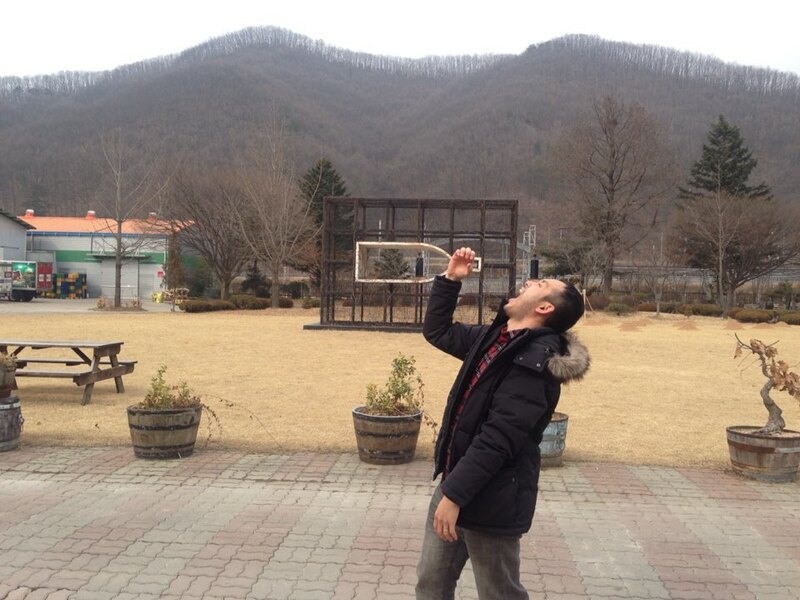 It was my first time in Gangwon-Do, a province known for its fresh air and greenery. And green, indeed! 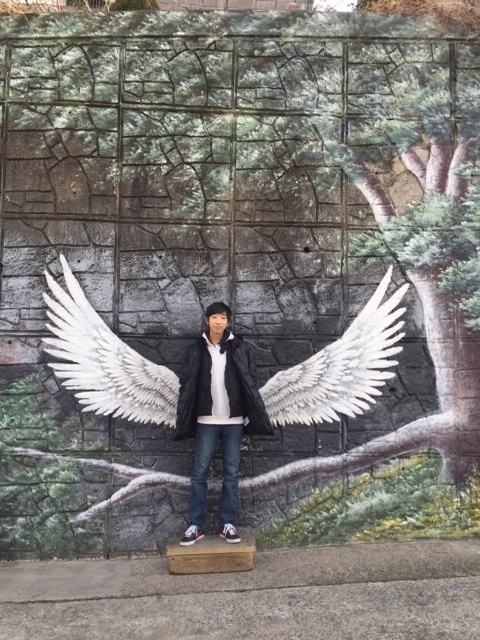 This past weekend, Y and I made another trip down to Gwangju to see my parents. At my request, the four of us went to Boseong, a place famous for its green tea fields. I drank in the mountainsides, the lush carpets of green to my eyes' and heart's content. We walked through a forest, studying the differences in each tree: its bark, its leaves, its height and width- the symphony of cicadas cheering us along. The rolling hills, the shades and hues of green. The trickling sound of a nearby stream, our feet thanking it for a brief respite from the humidity. Korea, you are beautiful to me. To Y's bewilderment, I am surprisingly content being left to my homebody-ways. He recently pronounced me as an introvert. Though I disagree, I do admit I don't mind me some quality alone time. Maybe it's the amalgamation of changes, events, people, places surrounding me, that even with the absence of work, my mind is at a constant "Go, go, go!" trying desperately to take in, process, soak, and embrace all that is around me. There is something thrilling about being in a new city, uncovering gems in "new" neighborhoods. But it is also quite something to revisit a place with fresh perspective. Last week, Y and I had a wander in Insadong. It wasn't our first time there but we loved it nonetheless. We loved its traditional vibes, with a plethora of ceramics, calligraphy, and artwork to take in at every step. Not to mention, we absolutely loved that all the signboards were in Korean. It feels like a blur to think that last week, I was in a winter wonderland in Hokkaido, Japan- Y and I went there to ski with some friends. It was surreal that two and a half hours on a plane could bring me to a land dusted with snow. After some late-night packing and only three hours of sleep for me, we got on the airport shuttle at 5:45am and were at the airport by 7am. We landed in Japan and had two hours until our shuttle to the ski resort. So what did we do? Had ramen for lunch, of course! After satisfying our stomachs, we piled into the shuttle bus to our ski resort. It was a two-hour bus ride there so when the bus stopped at a rest are, we made sure to pick up a few snacks to hold us over. We settled into our hotel rooms, unpacked, relaxed for a bit before we headed out to the village for dinner. Yakitori was our choice for our first night. Day 1 of skiing started with feelings of excitement soon followed by a whole lot of anxiety. My fear of heights made the first gondola lift terrifying - I took deep breaths and immersed myself in conversations to distract myself from the realization that I was dangling in the air and headed upwards to the top of a mountain. Once we got up to the top, the reality of the situation hit: the only way was down. Visibility was horrendous; we were barely able to see a few feet in front of us. Lunch was all-you-can-eat sushi and I was in heaven. Skiing followed by sushi may be one of the best things ever. The only thing better than that is following the sushi with a nap, which is precisely what I indulged in. Day 2 of skiing couldn't have been more different from Day 1. If Day 1 was the evil, wintry antagonist, Day 2 was the kind-hearted, warm protagonist of the story. Day 2 was sunny and clear, the landscape was breathtaking and it sure felt nice to be able to see where I was skiing. One of our nights, we devoured teppanyaki coupled with endless corny "punny" jokes: we laughed until our stomachs hurt. There were moments when I was so focused on getting down the slope safely; my eyes fixed on the ground beneath my skis. But then I would look up and be amazed at the view, the powdered trees, the snowcapped Mount Yotei. But on the positive side... the one perk of being at the airport? For one of my favorite classes in graduate school, I was asked to complete a genogram - a pictorial diagram of one's family relationships. To put it simply, it's a souped-up version of a family tree, depicting patterns in education, immigration, medical/psychiatric history, emotional relationships. It was one of the most challenging assignments but it forced me to dig deep to learn about my family's past and about myself. On a cold day last month, my mom, Y and I were gathered around our dining table. We began conversing about my family, my relatives and this sparked Y's impromptu drawing of a genogram while my mom shared with me and my husband things about my family. Listening to stories about my family, I knew in that moment this moment would be one I would cherish. It simultaneously lifted my spirits while making parts of my heart ache in unexpected ways. People say, you don't know where you're going until you know where you've been. One of the perks of living here in Korea is being able to connect and reconnect with my "roots", getting to spend time with relatives and family members I haven't seen in a number of years. Shortly after our afternoon of genogramming, Y and I did just that; we traveled the "routes" of Korea, connecting with our "roots". We started the epic journey across the peninsula of Korea traveling a little over an hour to Gongju to visit Y's grandfather. Though it was a short visit, it was all the more meaningful to start our trip off like this because it was the first time I met him. He was just as jolly as Y had told me and it filled my heart with love when Y's grandfather was so happy to meet me, his granddaughter-in-law. We then drove down to Daejeon with Y's grandfather and Y's aunts and uncle. We had lunch there. A precious moment: the restaurant was on the second floor and there was unfortunately no elevator. Climbing two flights of stairs was a lot for grandpa so Y carried him on his back and brought him up to the restaurant. After lunch, we visited the Daejeon National Cemetery. It was a solemn visit, a chance to pay tribute to those who sacrifice for this country. From Daejeon, we drove to Okcheon. In Okcheon, Y's uncle showed us around and brought us to famous poet, Jeong Ji Yong's (정지용) Literature Gallery and to the former home of President Park's mother, Yuk Young Soo (육영수). We went from Okcheon to Yeongdong. On our way there, we stopped by a restaurant to have dinner. 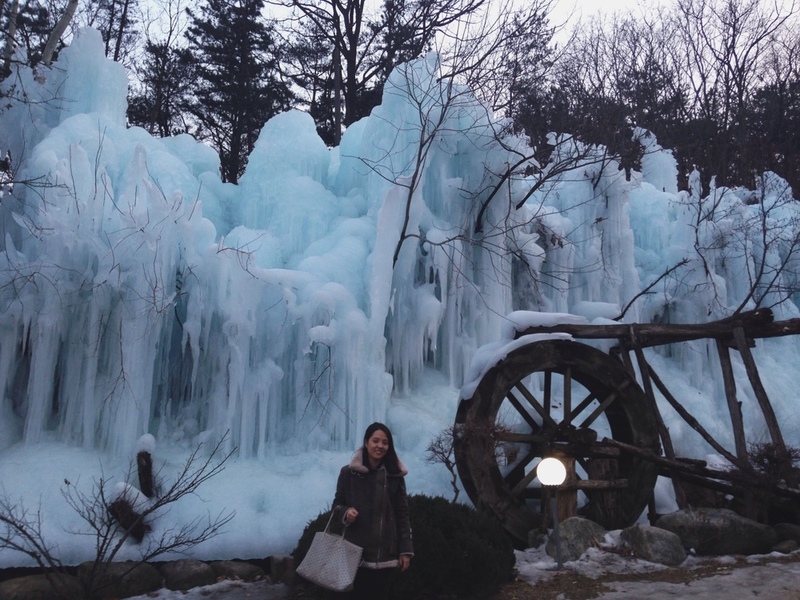 In front of the restaurant, there were these majestic ice forms. We indulged in one of the best bibimbaps I've ever tasted. Our day in Yeongdong was jam-packed. We visited Wine Korea; apparently, Yeongdong is known for their grapes, hence their wine as well. We then drove to a small village called No Geun Ri / No Gun Ri (노근리), a location that holds the tragic history of the No Geun Ri Massacre. During the Korean War, U.S. military killed innocent Korean civilians who had been told by U.S. troops to flee their nearby villages. After one man's 50-year relentless quest and pursuit of the truth of the No Geun Ri Massacre to be revealed, it was uncovered, investigated and acknowledged by those outside of Korea. The No Geun Ri Peace Park now stands near the location of the massacre and it serves to remind us all of the importance of human rights. History isn't what we learn in history class; inside history is story, stories, stories of individuals, stories of families. No Geun Ri made me think about Korea's roots, where Korea was, where it has been - the pain, suffering, loss. Our last stop in Yeongdong was 월류봉, a beautiful scenic point, where the mountains meet water. After the heaviness of No Geun Ri, this location breathed life and hope into me and charged me with refreshment in my soul. During this trip, we visited so many places but I will never forget the feeling I had when I stepped out of the car, grabbed the rail and took in the sight of the magnificent mountains, the sound of the rippling waters, the smell of the crisp winter air. From Yeongdong, we drove down to Gwangju to my parents' place. On our way there, we made a mandatory pit stop and recharged with fuel for the car and fuel for us. Jumping for joy because we made it to the top! After our hike, we treated ourselves to some fabulous food. It may be one of the best meals I've had, probably tasting even better after the strenuous walk. It's apparently in to wear plaid and throw up peace signs. With full bellies and tired legs, we packed into my dad's car and were on our way to Tongyeong. It was my second time there but first with the husband and his enthusiasm to go there and meet my relatives added another layer of excitement for me. We had an unforgettable dinner of oysters: steamed oysters, raw oysters, fried oysters, oyster salad, oyster rice... you get the gist. (Reminds me of Forrest Gump: "Shrimp salad, poached shrimp, fried shrimp, shrimp cocktail...) We had the mandatory 충무김밥. And our time was filled with chats. There's something I love about being in Tongyeong and watching my dad interact with his aunts and uncles. I love listening to their stories and trying to decipher what they're saying through their thick dialects. It makes me think about how my dad was once a child and his childhood memories, hopes, dreams and wishes. The next day, we explored Tongyeong. We visited an arts and trade museum and a museum honoring author Park Kyung-ni, we rode a cable car up a mountain and we walked the painted hills of Dong Pi-Rang. Don't be fooled by my smile; it belies my fear of heights. We then ended back in Seoul with my parents and celebrated Lunar New Year with relatives. The epic trip took a toll on our bodies and Y and I ended up getting terribly sick. (We then unfortunately and unintentionally passed it on to my parents.) But the trip will go down as a good one still.